Busy week for me this week. I have a custom order for 8 placemats - almost done, just need to pop into my local quilt shop for fabric for binding. The placemats are made from a fun fat quarter pack called "Cinnamon Spice" by Blackbird Designs from Moda fabrics. I have lots of fabric left, so watch for more items made from this fabric line in the near future! 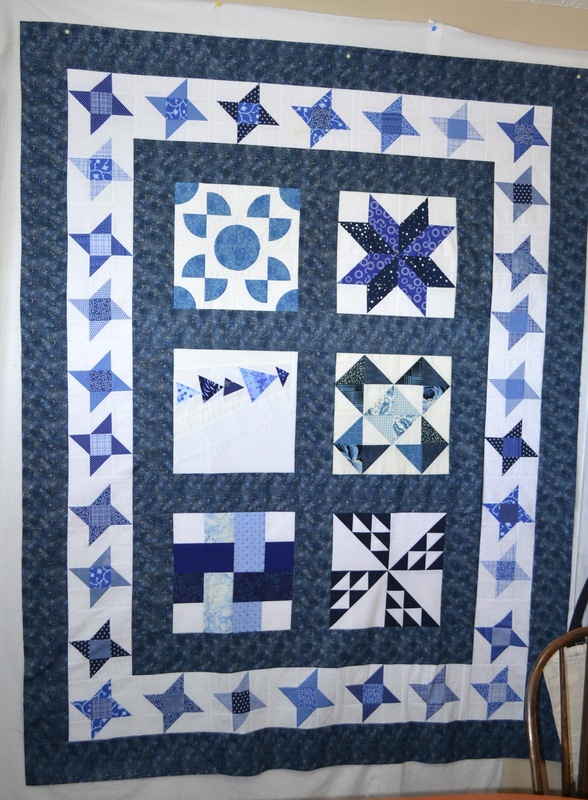 I also finished the friendship star border on my blue & white quilt and added the final blue print border, bringing it up to a nice lap/twin size quilt top. Just need to look for a backing and this one is ready to go out for quilting! 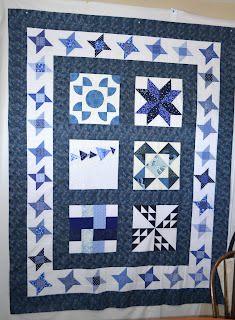 And finally, I had 5 friendship stars left over after I pieced the border for the bigger blue and white quilt and put them together into a table runner that's now listed for sale in my shop here! So, that's what's happening in my sewing room this week! How was your week? Love the blue and white. You have done a lot more than myself! Beautiful! Love, love the blue and white. One for my list of things to make too! Wow! You were super productive! The placemats are great.